Sometimes we don't know the difference between a bunny rabbit fairy-tale, and the gospel. Once you hear good news, it starts to uproot every poor interpretation of scripture that was passed down to you. God destroying the soul in hell is one of those fairy-tales... more like a night-mare on Elm St really. Matthew 10:27-29, “Whatever I tell you in the dark, speak in the light; and what you hear in the ear, preach on the housetops. And do not fear those who kill the body but cannot kill the soul. But rather fear Him who is able to destroy both soul and body in hell. Are not two sparrows sold for a copper coin? And not one of them falls to the ground apart from your Father’s will." This enigmatic statement by Jesus is used as a proof text that God is the author of destroying people's souls in hell. In fact today on Facebook a guy who is so twisted into religion he refuses to see straight said, "The bible says that Jesus said, 'Do not fear them that can kill you. Fear Him who can after ending your life put your soul into hell!' I don't think anyone can imagine a love that can do that. But Jesus can!" What?! The same Jesus who said "love your enemies" and the same one John said, "God is love" we are supposed to believe we should be terrified of because his love is so strong and so above our comprehension, He can end your life and put your soul in hell? When one appeals beyond common sense logic and instead says "God's ways are higher" they are in the end simply justifying their interpretation. Common sense tells us that if a mother has affection for her child, God does so infinitely more. No, you can't imagine that unpredictable god, because he doesn't exist. Otherwise how can you trust a God that you can't be sure of his character? So let's break down this passage a bit and join me as we discover the goodness of God. In order to do so, we are going to need to recover some definitions as we go. Anytime I find a passage that seems inconsistent with the nature of God (God is love), it is an invitation to dig in and discover what it really says. That includes comparing scriptures and looking into the Greek of each passage. Hang on. I think you'll like it! Let's start with context. Jesus is sending his disciples on a mission:“Whatever I tell you in the dark, speak in the light; and what you hear in the ear, preach on the housetops. It is a risky one in that generation, because they are sent into the midst of legalistic wolves. Paul first said that the Law was the veil blinding the Jews in his day, but then he goes on to say in 2 Corinthians 4:4, "whose minds the god of this age has blinded, who do not believe, lest the light of the gospel of the glory of Christ, who is the image of God, should shine on them." The god of that old covenant age which was obsolete and fading away, was the Law. They made the Law their god so any revelation of God as love met with a crushing violent response. Those killing the followers of Christ between the cross and the fall of Jerusalem were the unbelieving Jews according to both Jesus and Paul. Jesus spoke to the religious leaders in Mat. 23:31-36, "Therefore you are witnesses against yourselves that you are sons of those who murdered the prophets. FILL UP, then, the measure of your fathers’ guilt. Serpents, brood of vipers! 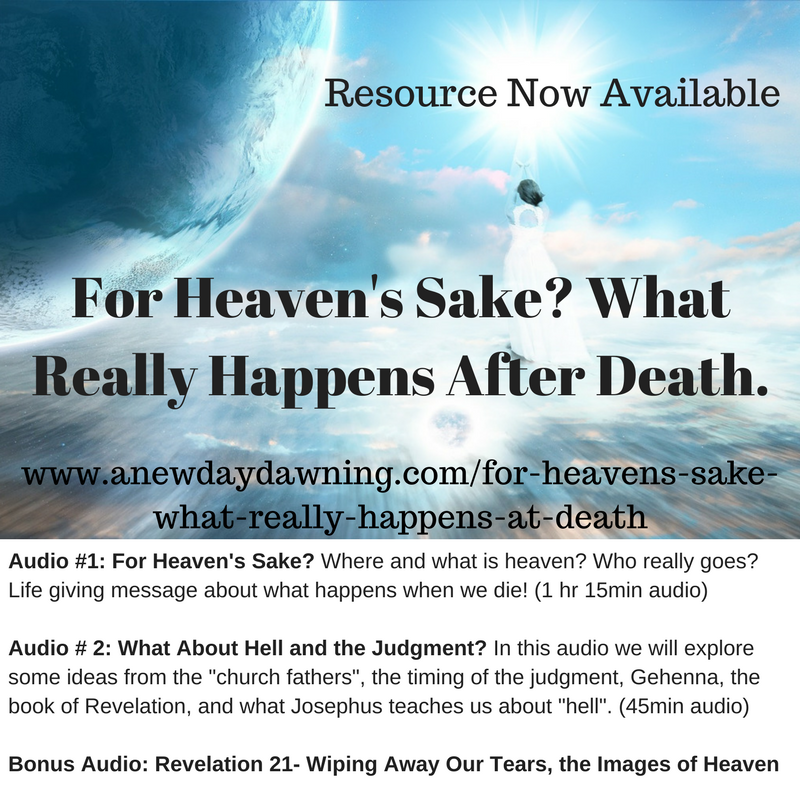 How can you escape the condemnation of GEHENNA? Therefore, indeed, I send you prophets, wise men, and scribes: some of them YOU WILL KILL and crucify, and some of them you will scourge in your synagogues and persecute from city to city, that on you may come all the righteous blood shed on the earth, from the blood of righteous Abel to the blood of Zechariah, son of Berechiah, whom you murdered between the temple and the altar. Assuredly, I say to you, all these things will come upon THIS generation." Paul said in 1 Thess. 2:14-16, "For you, brethren, became imitators of the churches of God which are in Judea in Christ Jesus. For you also suffered the same things from your own countrymen, just as they did from the Judeans, who KILLED both the Lord Jesus and their own prophets, and have persecuted us; and they do not please God and are contrary to all men, forbidding us to speak to the Gentiles that they may be saved, so as always to FILL UP up the measure of their sins; but wrath is about to come upon them to the uttermost." WHO WERE THEY TO FEAR? Interesting question. People have assumed that they were to fear God because he could destroy the soul and body in hell. There are several problems with making God the "Him" in this passage through. The Greek is ambiguous and can simply mean, "the one". So he describes a group of "ones" and then the "one". Who or what is he referring to? First of all the word "hell" is Ge-henna, and was literally the Valley of Hinnom where hundreds of thousands of bodies were tossed when Rome attacked Jerusalem in AD 66-70. It is the place where the the worms literally ate their bodies after having been burned in the city of Jerusalem. It is not a symbol for a place of eternal torment. It is a literal place one can visit today. Secondly, it was the unbelieving apostate Jews who could kill the body, but it was the Romans who would destroy the soul. Strongs 5590 psyxḗ (from psyxō, "to breathe, blow" which is the root of the English words "psyche," "psychology") – soul (psyche); a person's distinct identity (unique personhood), i.e. individual personality. Thayer: [can be] the soul (Latinanimus), a. the seat of the feelings, desires, affections, aversions (our soul, heart, etc. (R. V. almost uniformly soul); for examples from Greek writings see Passow, under the word, 2, vol. ii., p. 2589b; (Liddell and Scott, under the word, II. In other words, soul, can mean the inner life, the hopes, dreams, thoughts desires, and plans of a person. For instance, notice how it is used to describe Mary's experience of being the mother of Jesus. In Luke 2:35, it was prophesied to her, "(yes, a sword will pierce through your own soul also), that the thoughts of many hearts may be revealed.” It meant her heart would be broken, her soul wounded, the plans for her son would seem to be dashed. Let's see one more definition here. Destroy. Does it mean to annihilate? Does it mean the soul would cease to exist? Does it mean continuous torment? No! Look at the other ways this word is used. KJV: not that we PERISHING? The word "destroy" is used above to describe the threat of perishing, i.e. physically dying in the storm. The word destroy is also used to describe the mission of Jesus to seek and save that which was LOST. They were still alive but their souls lost their way. Their souls were not annihilated, but they could not perceive. Their souls were in darkness where fear, confusion, unbelief, depression, and hopelessness kept them blind! Yet this is the same word as destroy. Jesus even describes the LOST sheep, who were still alive, whose souls had not vanished, nor were they utterly beyond hope. Yet this is the same word as destroy. What does all this mean? It means that the unbelieving Jews had hopes and dreams and plans of throwing off the Roman rule from their nation. They had expectations in their souls that God would rescue them from Rome. When in fact Jesus warned them to flee the coming wrath of Rome instead (Matthew 24). GOD'S ROLE IN ALL OF THIS? So what was God's role, his encouragement in all of this? Jesus is contrasting the Father with Rome and the unbelieving Jews. The unbelieving Jews would kill the body (Mat. 23). The Romans would kill the body and their soul would lose it's Jewish hopes. God in contrast would be their strength, their hope, and their encouragement. How interesting! Did you know that the word "will" is not in the Greek. Instead it says, "not one of them will fall to the ground apart from the Father." The idea is not that God somehow wills that one of the sparrows fall to the ground at some point, and so he wills for some of them/us to be persecuted to death. Rather it is the idea that even two sparrows that are valued so cheaply by men, will never fall to the ground alone, but with the Father's presence always with them. How much more then, will he be with his sons and daughters, if something were to happen to them. He is "with them". He is "with us" strengthening, helping, encouraging, and empowering with his present tense love. Throughout scripture is the admonition to "fear not for I am with you" (Isaiah 41:10). It is God's loving presence for us that will cast out all fear (1 John 4:18). You will never be alone! He sent them out as sheep among wolves. While they were to trust God, they were to flee from Rome, the one who could destroy their Jewish dreams. In addition, they were to know that some of them may even be put to death by the unbelieving Jews. Do not fear the ones who can kill the body (unbelieving Jews) but fear the one who can ruin their soul's hopes and dreams in the Valley of Gehenna in AD 66-70... Rome. If they aligned with the unbelieving Jews that was exactly what would and did happen. In the midst of this know that God will never leave you. "If his eye is on the sparrow, I know he watches me." Am I sure about this? Yes! The next verse tells them NOT to fear in their relationship with GOD... "Do not fear therefore; you are of more value than many sparrows." WANT MORE OF THESE AWESOME GRACE FILLED BLOGS? SIGN UP TODAY WHERE YOU SEE THE RED ARROW AND ALSO GET AN INSTANT DOWNLOAD BIBLE STUDY FOR FREE! WOULD YOU CONSIDER A DONATION OF ANY AMOUNT TO THIS MINISTRY TO SUPPORT THE MESSAGE OF GRACE AND GOOD NEWS? Newer PostDoes God Give Second Chances After Death? Older PostThe Healing of Hades and the End of the Lake of Fire!